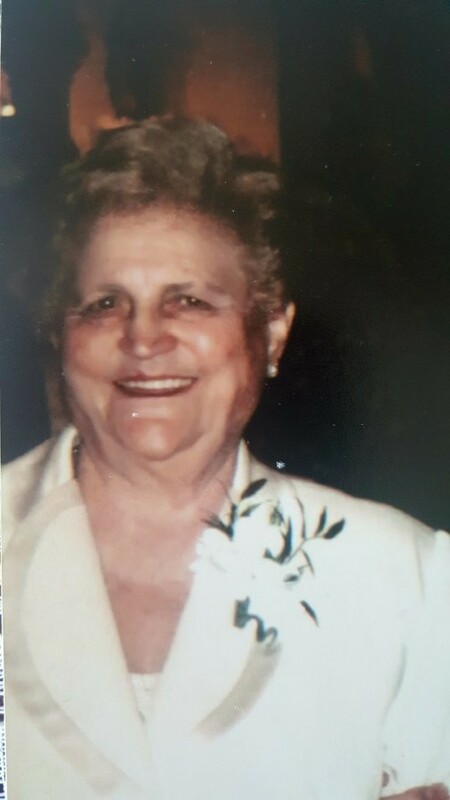 Southbridge... Maria "Nonna" (Sebastiani) Marcucci, 91, was called home by her Lord and Savior Jesus Christ surrounded by her loving family on Friday, March 16, 2018. Maria was born in Bolognano, Italy on September 23, 1926, daughter of Camillo Sebastiani and Elisabetta (Salce) Sebastiani. She married her husband Santino Marcucci on November 29, 1945, also in Bolognano, Italy. He predeceased her on October 1, 2006, after 61 years of marriage. Her husband Santino traveled from Italy to the United States in 1948, so they could have a better life. He found work in Southbridge at the United Lens Company, and in 1949, sent for his wife Maria and daughter Elisabetta. Santino and Maria had 8 children together, a daughter Giovina predeceased her in Italy. She leaves 5 sons Santino "Gabe" Marcucci and his wife Jeanne of Thompson, CT, John Marcucci and his wife Susan of Holland, James Marcucci and his wife Kimberlee of Southbridge, Mario Marcucci and his wife Darlene of Southbridge, Richard "Rick" Marcucci and his wife Kim of Southbridge, and 2 daughters Elisabetta "Lisa" Anderson and her husband Edward of Southbridge, and her daughter and full time caregiver Marisa Stevens with whom she lived. She leaves an adopted daughter Miria DeSantis of Bolognano, Italy. Maria leaves 36 grandchildren and their partners Martin and Tina Anderson, William and Lynn Anderson, Karen Anderson Jinessa Anderson, Kristopher Anderson, Angela and Shawn Hetherman, Erica and Michael Lunden, Melissa and Erich Wenc, Nathan and Alyssa Marcucci, Stephen and Jessica Marcucci, Adina and Tommy Laprade, Cara Marcucci of Southbridge, Santino Marcucci, Brooke Ford, Courtney Ford, Sadie Ford, Channing and Jade Ford, Sergio and Jessy Marcucci, Carisa and Scott Bachand, Guida and Salvatore Boscarino, Joshua and Ashley Stevens, Kristi Marcucci, and Hannah Marcucci. Maria also leaves 39 great-grandchildren, Juliana, Benjamin, Ian, Liam, Lauren, Logan, Raymond, Luna, Alex, Emily, Sophia, Gavin, Logan, Johnathan, Ava, Anthony, Lauren, Ryan, Zachary, Darren, Vincent, Gabriel, Kaden, Gianno, Nikko, Autumn, Summer, Dayton, Landon, Stella, Roco, Vera, Lena, Mya, Noah, Angel, Aliyah Ajalyce, and Marcus. She also leaves 3 sisters in Ottawa, Canada, Maria (late Alberto) Breda, Lucia and Guiseppe DiFederico, Rosa and Ettore Latanzio, her sister-in-law Paulette Becker and her husband Jack. She also leaves her Godchildren, and relatives in Italy, nephews and nieces and their children in Ottawa, a nephew Robert Sebastiani of Florida and a niece Michelle Sebastiani of Charlton. She was predeceased by her brother Pasquale Sebastiani. Maria had an adopted family that she loved and was very close with and spent many good times with the DiDonato Family. Maria worked at the American Optical Co. in Southbridge, and Old Sturbridge Village for a combined total of 45 years. She enjoyed cooking, and was a fabulous cook, and loved serving her homemade food to all the family, relatives, friends and the community. She could make a five course meal in 15 minutes, leaving you so full and satisfied, but yet waiting for her next homemade meal. She also was an avid New England Patriots fan, and Red Sox fan, never missing a televised game. Maria was a humble servant of God with a heart after Him, always serving and taking care of people. There wasn't anything she would not do for anyone. Whether you asked her or not, she would do it anyway. She loved Fr. Robert Grattaroti’s masses at Saint Joseph's Church in Charlton. She also loved having visits from her daughter's Pastors Esteban and Rebekah Carrasco, Pastor Lisa Morales, and their families of the House of Destiny Church in Southbridge, and her cousins Pastor Michael and Barbara Rondeau and family of Viewpoint Church in Southbridge. She loved her doctors, Dr. Paul D. Harrington and his wife Kathy of Charlton Family Practice in Charlton, and Dr. John Tumolo of Southbridge. The entire family would like to thank Harrington Hospital, the entire staff of The Overlook Hospice Nurses and caregivers, her PCA Kathleen Bond, and the Southbridge Fire Department for all their help and dedication. Our entire family of about 90 people loved her with all our hearts, and will miss her till we meet her again! Calling hours will be Wednesday, March 21, 2018, at Saint Joseph's Church, 10 H. Putnam Road, Ext., Charlton, MA 01507. The funeral Mass will follow at 6PM in the church. Burial will be private. The family request that FLOWERS BE OMITTED. Please honor their requests, and consider a donation to Overlook Hospice, 88 Masonic Home Road, Charlton, MA 01507, or to the Center of Hope, P. O. Box 66, Southbridge, MA 01550.